Honour has been suggesting to me for a long time now that I should visit the Ivory Tower Library of Primitives and learn some building fundamentals. Hmmm. Perhaps she phrased it more strongly than a suggestion. 🙂 I kept insisting that I am a scripter. 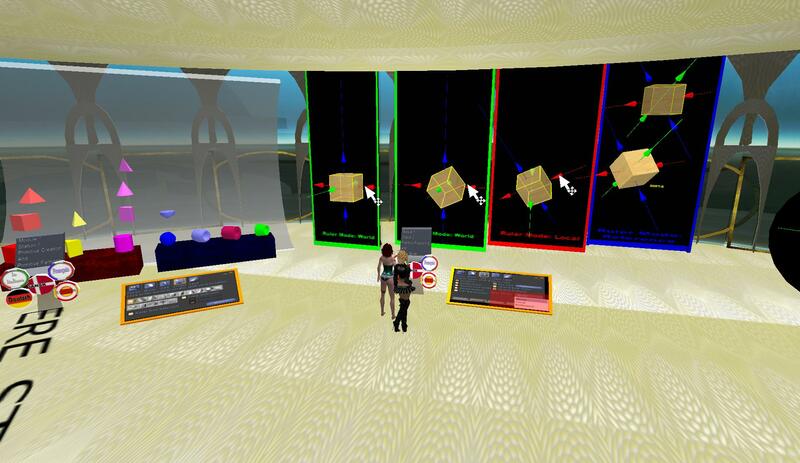 But lately I’ve needed to do a lot of building-type things – offices, graphs, malls. So I finally decided that Honour is right and I need to learn some of this already. Ever lazy and always enjoying company, I coereced Dale into joining me. I figured Dale would give me fellow-scripter support. We’d both been playing in our respective inventories, so I may be sporting a bit of a different look in these pictures. 🙂 Trust me – I sure did my best to crop them. We made it to ITLP uneventfully. It is a very pretty sight, even for one dreading what she feared would be an ordeal. *grin* That would be me. We wandered from the landing site to the entry. There was an adorable whatever there to greet us and explain how the ITLP worked. I’m cheating. I’m too lazy to write up a description of ITLP – I’m going to steal relevant information from the first notecard. ITLP is an on-going project by Lumiere Noir. 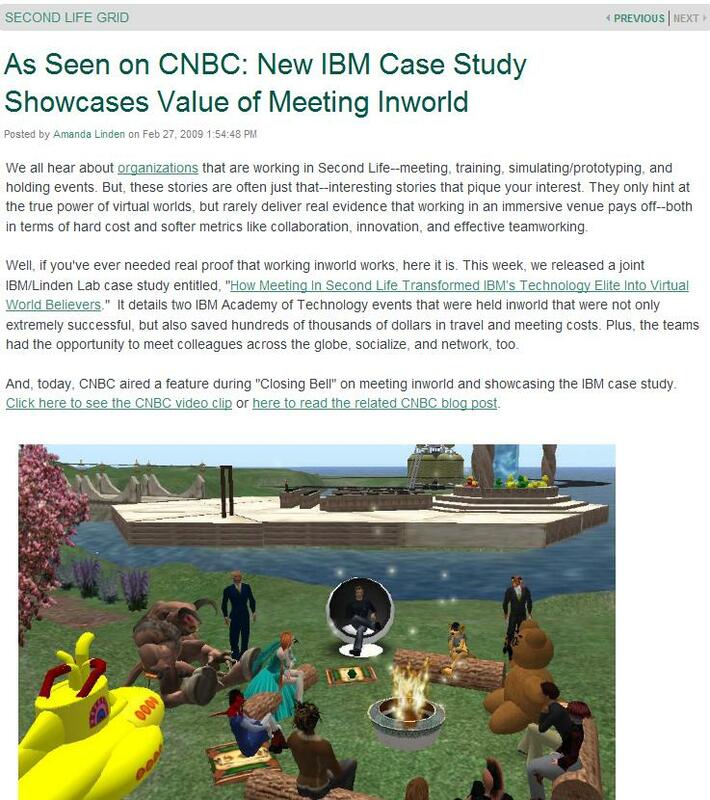 At this time Linden Labs has underwritten the costs of the sim. I made this tower in the hopes that it would give you a substantial headstart on your arrival here. It contains a lot of tips and tricks of the building system that have taken a good while to develop and collect. Over time I’ll include a vehicle tutorial on building and scripting vehicles and a website (both in the works as I write this, go to http://ivorytowerlibrary.com for the website), a module on sound, animations, avatar customization and attachment building. That’s in planning for the forseeable future…maybe a month or twelve away (this was written July 10, 2006). Long term I’ll include an extensive module on scripting, script building, weapons making…and…more advanced building techniques. Don’t hold your breath, all of that is still just the gleam in the milkman’s eye for right now! 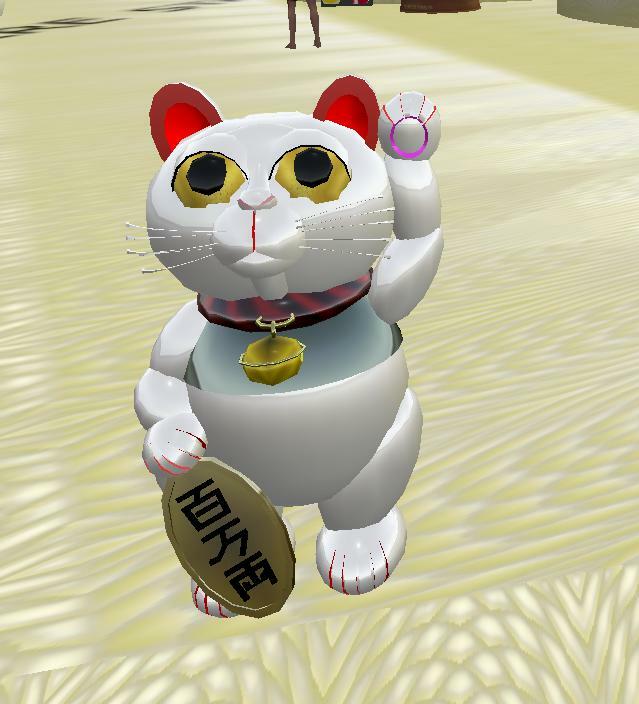 What the tutorials are: The tutorials are a thorough grounding in the properties of the different primitive types (building blocks), and the editing tools that are used on those primitives. 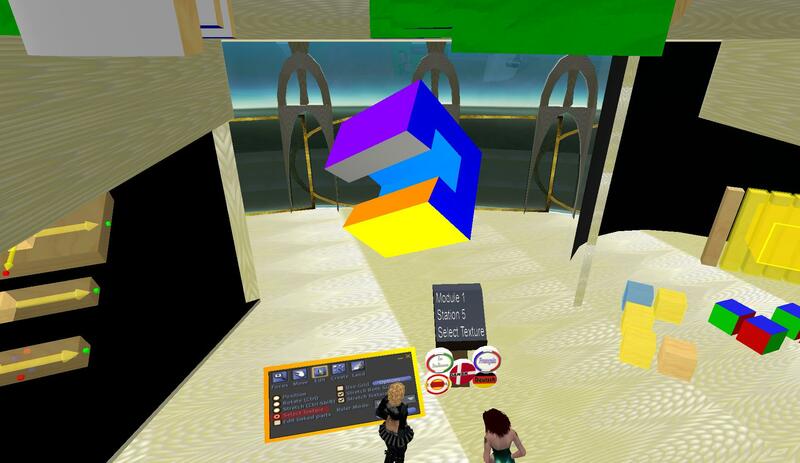 Several techniques to make building with prims more easily are described in detail. Far from being an ordeal, the tower is actually very interesting and informative. I was pleased to realize that I knew most everything in Module 1 (the first floor). Things got a bit more complicated as we went up the tower. I knew a good bit of Module 2, but certainly not everything. So I began collecting the notecards and reading the exhibits a bit more carefully. At least ONE of us was paying attention to the exhibits. One of us was playing on the exhibits. I don’t really learn this way – by reading. That’s why I have Hell as my scripting teacher. I learn by doing things. By having actual goals that I need to achieve. That’s why I keep throwing myself under that darn bus. 🙂 I’m not going to learn building by reading note cards either. That’s why Honour gave me a building assignment (yes, yes, yes – I KNOW I owe you that box…. 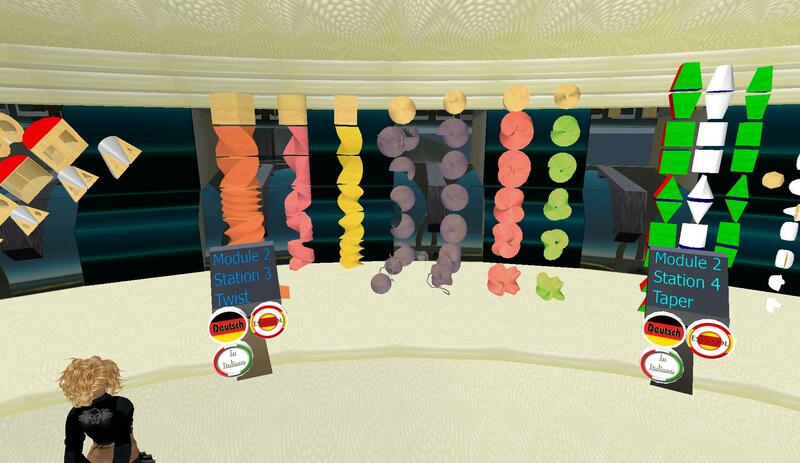 9 prims… I remember). But these cards and the exhibits will definitely be handy when I need to remember where to find various edit commands, and what kind of functionality is available. Everyone comes to the ITLP. 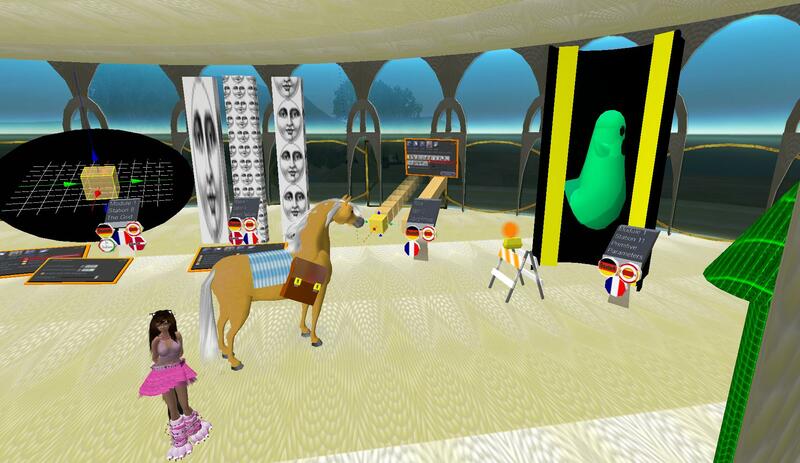 Do you think the horse (yes – that horse is an avatar) is building a barn or a race track? Or something else entirely? The problem with spending so much of my work week in virtual worlds is that I am now finding it much harder to work on the weekends. I used to script on the weekends. I got a lot done. Now – I IM and I shop and I try to hang out more with friends. And all the while I whine about how I SHOULD be working. It’s a wonder they don’t back-hand me across the sim. Thank you all for that, by the way. 🙂 I appreciate your self-control. 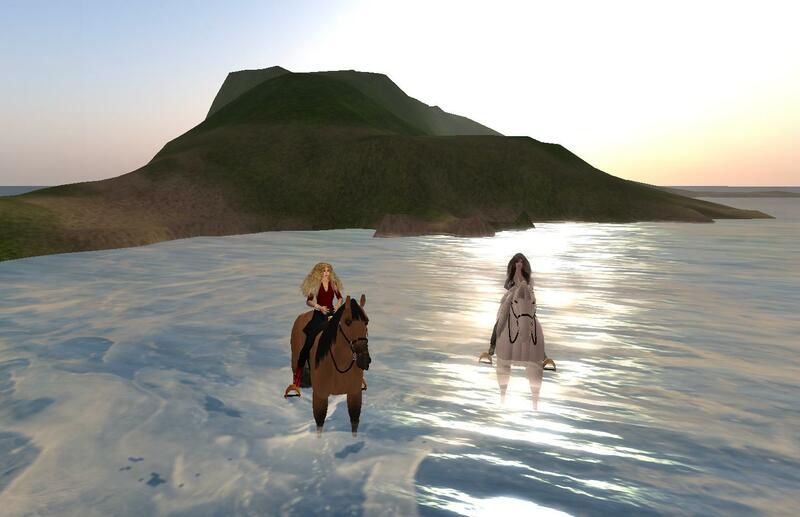 The other day I took Hell and Nat to one of the interesting places I have found (Thanks Krissy, for pointing out a fun, new place to explore Krissy always IMs me to tell me neat builds and sims that she is exploring!). I like the cool vehicles that people have created in SL. We looked at the bikes and other toys for a bit. Hell and I both want that bike, but suspect that it falls outside our disposable income. 🙂 And we’d need someplace to race them. C’mon all of you – I am SURE that there is some speedway out there where we could take our cars and choppers and whatevers and race. I mostly hang out where there is beach and water and flowers and trees. But I could really be persuaded to landmark a speedway. So from the roaring exhaust to the quiet peace of another land. On one of my many attempts to find land and a place to call my own, my “realtor” showed me this build. Perhaps it was the color (have you noticed that I like red?) or perhaps it was the style, but I really liked it. Unfortunately, it didn’t suit my purposes and so I kept looking. I’ve kept it in mind however and saved the lm in case it should ever be the answer to the question. So the 3 of us hung out there, chatting and taking pictures. (I wonder if I will ever have the patience or time to learn to take photos as lovely as Nat’s? She was kind enough to get me as well.) As we relaxed and realized that there was no one around and how large the space was, we realized we had mission: PARTY!!! Oh yeah, we are going to throw a party there. 🙂 It’s a bit laggy, this is true, and there are some issues with rezzing things, but we have already begun figuring a way around it. If there are no neighbors – well, there’s no one to call Security and get us evicted. LOL. I can’t believe it. Now even my son has a female avatar. He started playing Guild Wars. Oh yes, he has the expansion pack as well. After all, when I am addicted to MY virtual life, who am I to refuse the use of my credit card to him? The graphics in GW look much like SL. Each time I catch a glimpse of his screen, I blink in confusion, because I know he isn’t in SL, but it looks like “home” to me. Anyway….. So he’s got a female av. (He’s 18, I can’t stop him. LOL. Happy Birthday, my wonderful boy!) I just looked at him when he showed me. You know that “look”. The one mothers give their sons. THAT look. He said “Mom, I know why all your friends have female avs. The guys just look stupid.” Oooooohhh-kaaaay. Sure. Of course. I said “So you too are spending hours staring at a female derriere (that is not the word I used, in case you are wondering). So HE made the “son” face back at me. You know that one too. That long-suffering “how many times do I have to make this woman see reason” look. He repeated that the guy avatars looked bad BUT, he hastened to assure me, when he plays a wizard, THEN he uses a male avatar, because the beards are cool. ROFL. Yeah, the first thought of a wizard IS Merlin or Gandalf, this is true. Quick thinking, hon. I may have once agreed that the male avatars are blech. But not anymore. I have seen some VERY good looking male avs in SL. Even more than good looking. A friend sent me a pic of her partner. He was downright hot. So guys – I’m simply not buying that excuse anymore. ‘fess up. So. Here’s my question to you all. 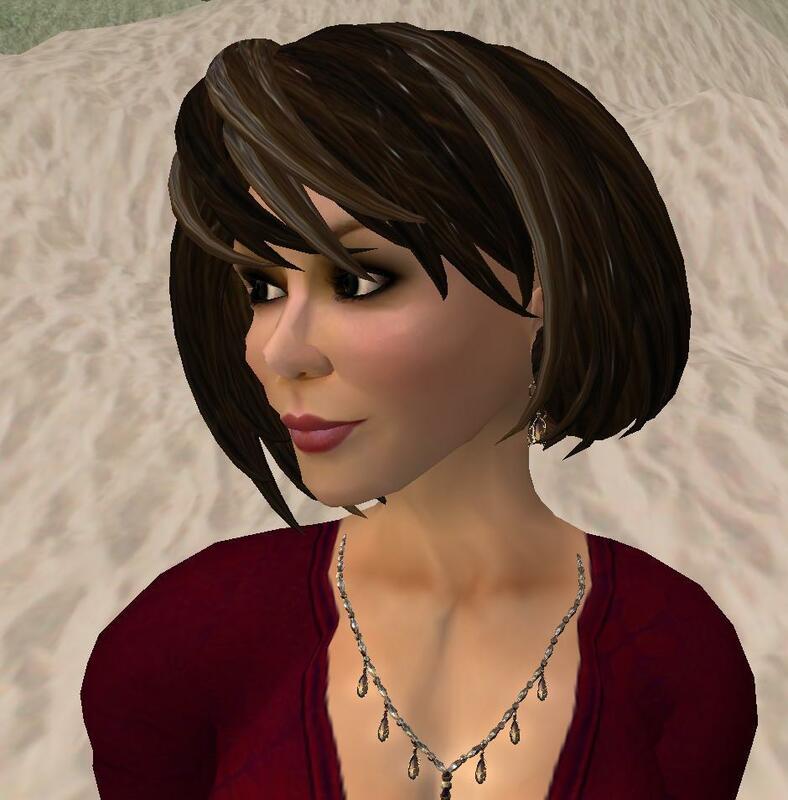 Do you know ANY females with MALE avatars? They have to be that av more than 25% of the time. That male persona has to have friends, inventory, history, etc. 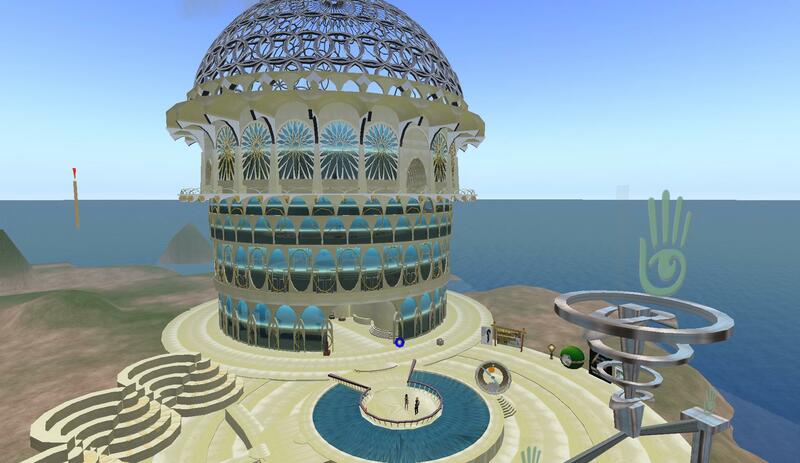 Come on – tell me you are or that you REALLY know a female living in SL as male. I have not, to the best of my knowledge, met a single one. I think it’s an urban legend. I love dancing. I really love waltzing. The waltz is a difficult dance to do well. In RL I used to do competitive dancing. /me smiles at happy memories. Oh yeah, I love dancing. My teacher Emilio was the best. The man could move like water. Like wind. Like the sexiest creature in the world. He had a grip that would not allow a woman to set one foot wrong. We competed in all the dances. Our rhumba steamed. We did a great hustle (my husband and I still hustle and burn the floor). Emilio and I did dirty dancing that had me bent backwards with my hair sweeping the floor. *grin* Ah yes, those were the days. We pulled in golds in nearly all our dances. Except waltz. I never once did better than silver. Waltz is hard. You need to hit your lines just so. Every move needs to be smooth, elegant, elongated, fluid. Watching a room full of waltzers is as soothing and mesmerizing as watching the ocean waves. 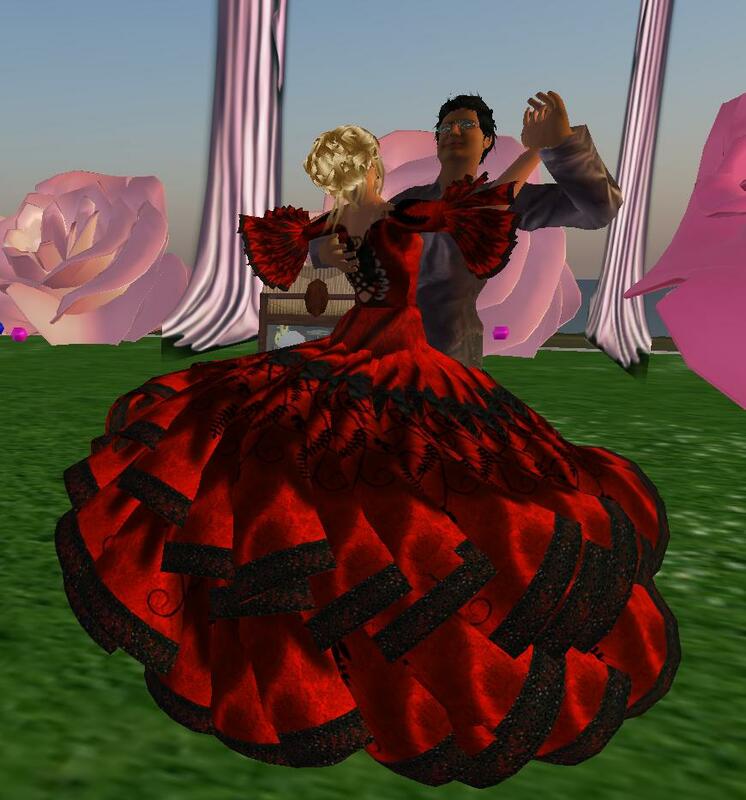 In SL – I hit all my waltz lines. 🙂 Nothing like a good pose ball , is there? 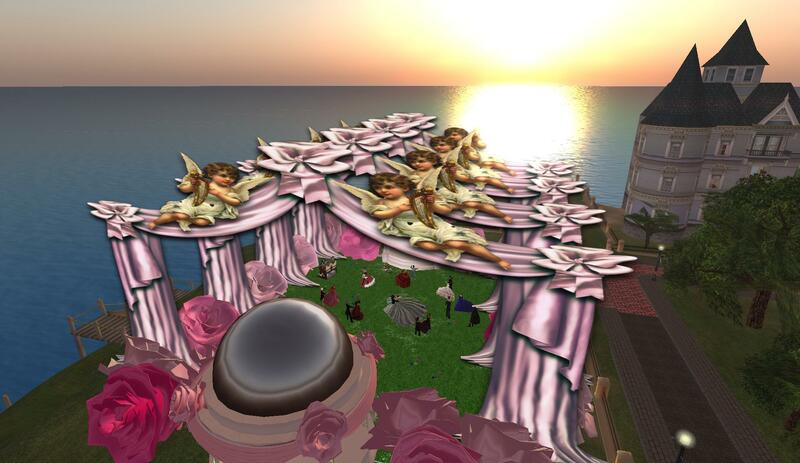 Shenlei hosted the Cupid’s Dream formal ball at Victoriana the other day. It was a lovely weekend afternoon, extending the Valentine’s Day celebration. I needed a break from all I’d been doing and thinking. So when the reminder came popping up, I knew it was just what I needed. I changed into my beautiful Debutante gown: Louisa in red. I put up my hair, slipped on my dancing shoes and hailed the taxi to Victoriana. I had the great good fortune to arrive at Victoriana Carnivale at the same time as my friend Lul. Yes, you’ve seen Lul here before. 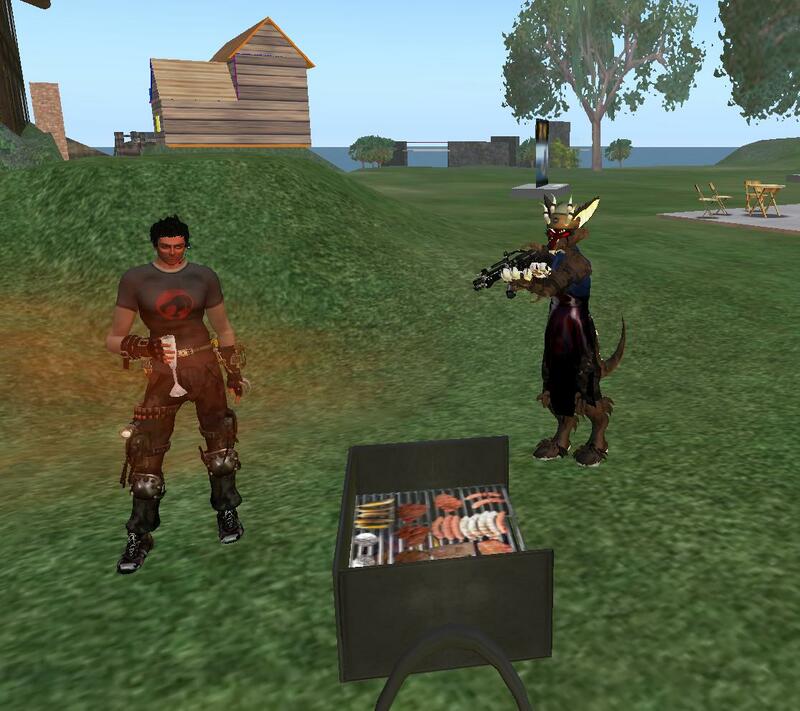 Go check out Santa’s sleigh and the opensim/SL chatbridge. I can report that not only is Lul smart, witty and sweet, he is also a wonderful dancer. 🙂 We followed the rose path to the party site. Shen had outdone herself with the decorations. Music was provided by Benton Wunderlich. Lul and I slipped onto a pair of dance balls and began waltzing. 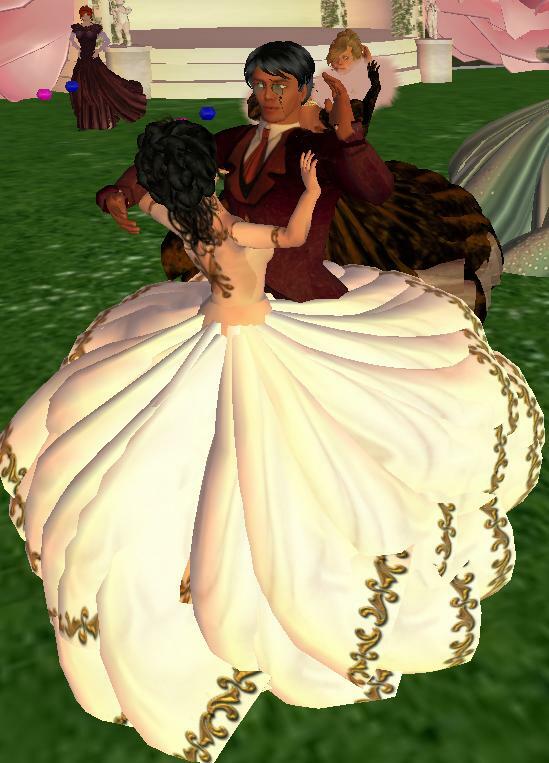 Ah, it’s so wonderful to dance in SL. 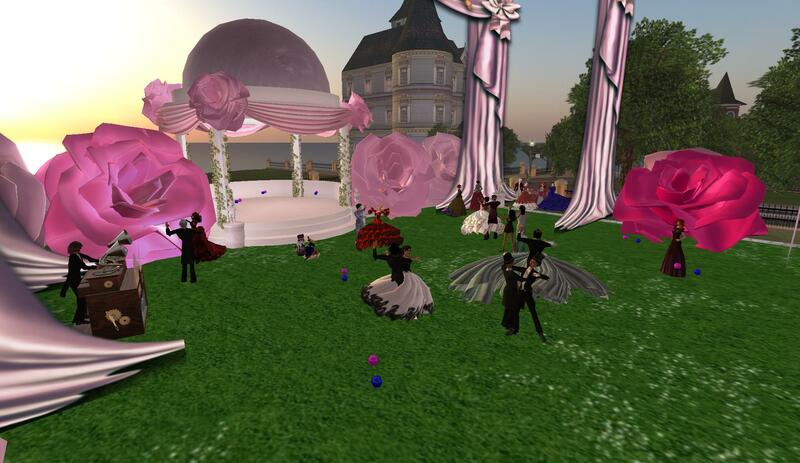 I’ve had so many wonderful times dancing in SL. I don’t know why it works. I would have thought that since I really DO love to dance, that dancing in SL would be hollow. But it’s not. For some reason, watching myself dance feels internally as if I am dancing. I hear the music. I feel the arms of my partner. My brain shifts gears and once again I am twirling and spinning and gliding across the floor, in harmony with my partner and the music. 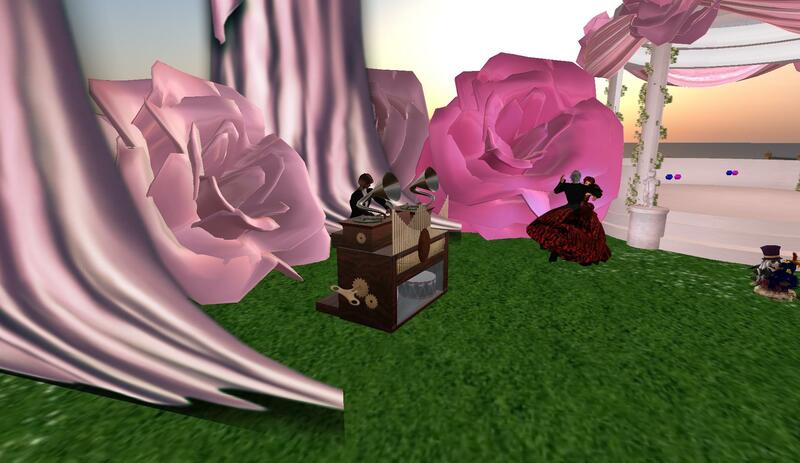 I am as happy dancing in SL as I am in RL. And it’s easier on my poor knees (which are hurting as i write this because, sigh, I started pushing the running again – upped the treadmill this week). 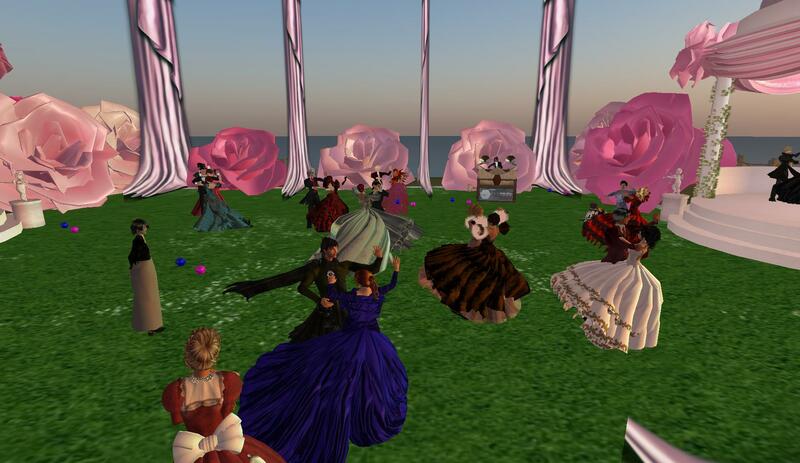 So Lul and I danced and chatted and waltzed away the afternoon. Victoriana is growing on me, no question about it. I’m very glad that they are not a role-playing sim as such. I can go and visit and hang out without having to “be” Victorian. I enjoy putting on a ball gown every so often and being an elegant lady. I also like hanging out in my jeans and enjoying all the amenities that Victoriana has to offer. I was there again today and was amused by the sight of the Seapot Racers. Too funny for words. 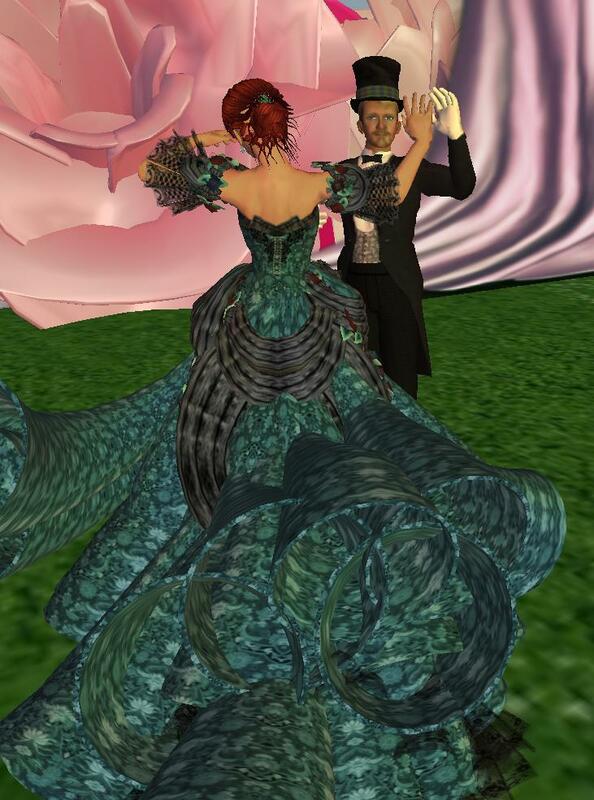 Now that I know that there are formal balls every month, I just may have to get there on a regular basis and dance. I’m looking for a partner for the ball in March, if you’re interested in joining me!